The Heineken Cup was established in 1995 with the intention of providing a new stage for club rugby. It has grown since then to become the premier club competition in the northern hemisphere. The tournament was originally set up under the auspices of the (then) Five Nations Committee by European Rugby Cup Ltd (now ERC) under the name of 'European Rugby Cup', but within days of its announcement it succeeded in attracting a title sponsor and the name was changed to the Heineken Cup. A second competition, the European Challenge Cup, is also run by the ERC, for teams who have not qualified for the senior competition. The Heineken Cup is played between the top 24 club teams drawn from the countries competing in the Six Nations Championship: Ireland, England, Scotland, Wales, France and Italy. Teams are seeded and divided into six pools of four teams each. Each team plays every other team in its pool, both home and away. Four points are awarded for a win, and two are awarded for a draw. An interesting innovation, though, is that teams can score bonus points: a Try Bonus of one point is awarded if a team scores four or more tries in a match, and a Losing Bonus of one point is awarded if a team loses by seven points or less. This has the effect of making games a more interesting spectacle as teams attempt to win bonus pool points with exciting plays to score tries or minimise the winning team's margin. The six pool winners and the two best placed runners-up (in terms of points scored) go through to the quarter-finals. The quarter-final winners go through to the semi-finals, and the semi-final winners meet in the final. The first competition, in 1995/96, was played between twelve teams from Ireland, France, Wales, Italy and Romania (who have not competed since). England and Scotland entered teams for the 1996/97 competition, which was expanded to 20 teams. English teams didn't compete in 97/98, despite Bath having won the previous year. Since 98/99 on, all of the Six Nations countries have entered teams. 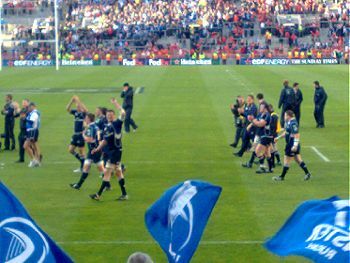 The Leinster squad thank the fans after their Heineken Cup semi-final victory over Munster at Croke Park. On 2nd May, 2009, the world record for attendance at a club rugby game was broken when 82,208 supporters watched Leinster beat Munster 25-6 in a Heineken Cup semi-final at Croke Park, Dublin. Leinster went on to win the 08/09 competition, beating Leicester Tigers 19-16 in the final, played in Murrayfield on 24th May, 2009. On 22nd May, 2010, Toulouse beat Biarritz Olympique by 21-19 in an all-French final to take the 09/10 competition, becoming the only team to win four Heineken Cups. On 21st May, 2011, Leinster, after being down 6-22 at half-time, came back to beat Northampton Saints by 33-22 to take the 10/11 trophy. On 19th May, 2012, Leinster became only the second team to successfully defend their title, when they beat Ulster 42-14 in what was dubbed the "All-Ireland Final". ↑ European Rugby Cup (html). ERC. Retrieved on 2009-06-01. ↑ ERC Rugby (2009-05-02). World record crowd witness Leinster win (html). ERC Rugby. Retrieved on 2009-05-02. This page was last modified 20:21, 20 May 2012.